Here at Golden Sands, we pride ourselves on providing our residents with good wholesome meals, sourced locally wherever possible, from our well-equipped kitchen. The menus on offer vary week by week. 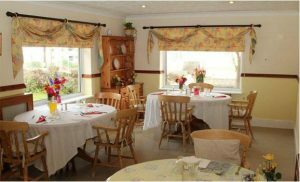 Residents are served breakfast, mid-morning drinks, lunch, afternoon tea and supper either in the dining room or in their rooms, whichever they prefer. Residents may request a hot or cold drink at any time. Arrangements can be made for residents to enjoy a meal with relatives or friends upon request.